On newsstands now!! 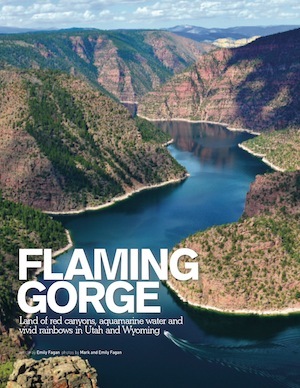 The August 2013 issue of Trailer Life Magazine features our story about our travels to the exquisite Flaming Gorge National Recreation Area. Situated between Utah and Wyoming, Flaming Gorge is a beautiful red rock canyon that rises steeply in shades of crimson that contrast vividly with the rich blues and greens of the Green River far below. We visited this area last summer and were treated to majestic rainbows following intense summer thunderstorms. We also wandered among a herd of nearly tame pronghorn antelope that were in residence at the Lucerne Valley Campground on the Wyoming side of Flaming Gorge, and then mingled with an equally tame herd of bighorn sheep at the Canyon Rim Campground on the Utah side. Trailer Life is a popular magazine from the good folks at Good Sam Club, and it covers everything to do with trailers and towable RVs. It is available as a print magazine subscription or as a Kindle subscription, and can also be found on newsstands. Covering lots of technical issues as well as many great RVing destinations, it’s a magazine we have always enjoyed.